:: Amusing Album Cover :: - Dreams are what you wake up from. I have been very prolific in my writing lately. Probably I have too much time on my hands. My mom would have said, "Cannot sit still ah, son,"
If she knew my current state of being. On the contrary, an idle mind is not necessarily the devil's workshop. Suddenly I am in the state of being necessary. And so I blog more, I write more, I create new websites. I play DOTA. I rekindle my interest in the japanese language. And I used photoshop again. 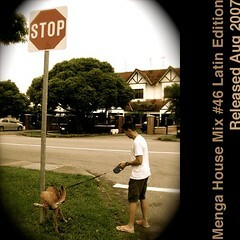 I made in just ten minutes for his latest Latin House Mix. But I thought it was amusing in its own way. Warped humour, some would say. That's the problem with having too much time. Now I'm trying to post the 100mb file on IMEEM. Let's see if it hangs. Time is such a double edged sword isn't it! cos i am deliberated not making myself available on the msn. being free doesn't equate to chatting everyone up, does it?